The RedHat Next Generation revolutionary new power management technology sets new industry standards for reliability and power consumption. 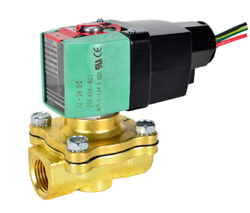 The new line of solenoid valves accepts both AC and DC voltages while improving performance. These 2-way, 3-way and 4-way solenoid valves are designed to handle most fluid control applications. Lower power operation (2-watt solenoid delivers the same performance as a traditional 17-watt AC solenoid).